The Denise brand has been a staple of the knitting and crocheting communities for more than two decades. 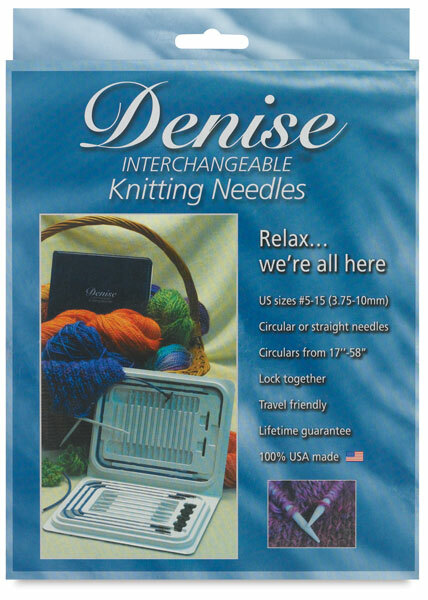 These Denise Needle Kits offer convenience and flexibility, all in one travel-friendly case. Denise Needle Kits are made in the USA and feature a lifetime guarantee. Knit outside the box! Changing needle sizes up or down to achieve the proper gauge is a cinch. Knitting small projects in the round with two circulars without buying extra needles is no problem. Obtain perfect gauge if you purl more loosely than you knit. What’s more, the needles are completely interchangeable with Denise Crochet Hooks, letting you add crocheting to your knitting and knitting to your crocheting. This versatile kit includes 10 needle sizes, six cord lengths, two extenders for joining cords together, and four end buttons to make stitch holders out of any cord or to use as end caps for making straight, flexible needles. ™ Denise is a trademark.™ Interchangeable is a trademark.